Light comes from the sun overhead. Notice the dappled light & shadows I have created, which is a product of the sunlight shining through the Acacia bush’s leaves & branches. Shepherd & the lost sheep (lamb)! This scene is based on the previous one, using similar photo’ reference. I have “zoomed in” on the shepherd’s & lamb’s faces to focus on their expressions. 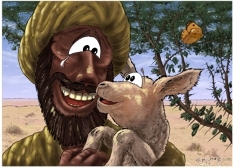 The shepherd has just found his lost sheep, & is delighted, relieved, grateful, after his search for it. The lamb is equally joyful at being rescued from being trapped in that Acacia bush! The tree behind the shepherd & lamb is the same one in the previous scene, an Umbrella thorn acacia (Acacia tortilis), which is found in semi-steppe shrublands, shrub-steppes, deserts & extreme deserts. I have shown more detail of its leaf structure & those long, sharp thorns which are so characteristic of this shrub/tree. I have added a butterfly to one of the Acacia bush branches. It is a Large Salmon Arab (Colotis fausta) which can found in hot deserts. This butterfly can be found in Israel, Syria, Turkey, Iran, Afghanistan, India, Arabia, Chad and Somalia.